An upright exercise bike fills the void in between a recumbent bike and a spin bike. The rider is positioned in a more comfortable position using an upright bike, as opposed to a spin bike. Also, the seat is larger than a spin bike, also adding to the comfort. However, it’s not as laid-back and loungey as a recumbent bike. Some people feel a little lazy on a recumbent, but don’t want the intensity of a spin bike, so an upright bike fits perfectly in the middle. With several types of bikes to choose from before you even start selecting which model to get, it can feel very overwhelming, which is why we’ve combed through a lot of different options and picked the very best upright exercise bike to fit your needs and your budget. By Max Shumpert: This article has been updated to reflect the most accurate information regarding upright exercise bikes available for those who are interested in exercising at home. The best 6 available have changed, and information has been added to assist individuals in finding the best upright exercise bicycles currently available on the market. The FAQ has also been updated. What follows are our suggestions for upright exercise bikes that you should take a close look at if you’re in the market for a bike. You can’t go wrong with any of the bikes on this list, but you should still read over the specifications and summaries that we’ve detailed to see which one is the best fit for you. The Schwinn 130 Upright Bike is our top pick for an upright exercise bike for a few reasons. The Schwinn upright exercise bike has essential features as well as additional bells and whistles which you’ll appreciate. The 130 is reported to be dead silent, a bit tough to assemble, and the master of offering different resistance experiences. The 130 packs with the quality of life features as well as more advanced features, so the unit has something to offer for everyone. The sheer number of display readouts on the 130 is impressive, but may be overwhelming for some users who just want the basics. The quick adjustment of resistance is a useful feature of the unit, but despite its magnetic resistance mechanism, there are a few reports of faulty units out there. The good news is that Schwinn offers a great warranty to go with this upright bike, so you won’t need to worry about any issues after you’ve set up your unit. The 130 retails for nearly half a grand, so you should do your best to make sure that you’re willing to get into a fully-fledged upright bike before making your purchase. Click here to read our in-depth review. 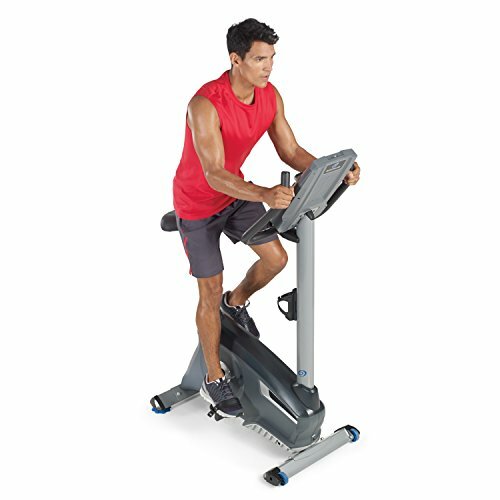 The Marcy Upright Exercise Bike with Resistance ME-708 is a remarkable bike that brings the sophistication of the magnetic resistance mechanism to a low price point. You don’t get any digital frills as a result. For the most part, the ME-708 is marketed as a budget option for people who want the utility and quietness of a magnetically controlled resistance bike but who don’t care very much for sophisticated software packages or multiple LCD screens. You’ll need to bring your heart rate monitor, but the ME-708 offers a stopwatch at least. The ME-708 leaves the exercise up to the user, which means that you’re on your own to develop a routine that works for you. Thankfully, there isn’t too much you can do wrong with this unit despite its relatively low price and humble advertising. The bike is very durable, but tall users may find that they tend to be dangerously close to keeling over while using the ME-708, so they may want to look elsewhere for an upright exercise bike. Despite the bike’s tallness, it has a very small footprint and can be easily moved and stashed wherever, though it doesn’t explicitly fold up. Check out our in-depth review by clicking here. The Schwinn AD6 Airdyne Exercise Bike is the only air resistance based bike which we’ll discuss in our roundup today. It’s a very well-constructed bike as a result of its fan-based resistance. However, this means that it’s not quiet and tends to be much heavier and harder to operate than other bikes. The AD6 probably isn’t the best bike to pick for users who are just getting started with their upright biking experience as a result. Part of the reason why this is the case is that to get more resistance out of the AD6’s system; you need to pedal harder. It’s a different style of working out, and it requires that you stick to your goals—without the help of any sophisticated software or LCD based information. At least the AD6 comes with six separate mounts for water bottle holders. The Nautilus U614 Bike is a bike with a lot to offer. 22 different programs and magnetic resistance means that you’ll be able to have a perfectly tailored workout experience that’s smooth, quiet, and doesn’t come with any surprises. The electronics package of the U614 isn’t as impressive as some of the other upright bikes on this list, but it’s no slouch, either. You won’t be able to connect to your U614 with Bluetooth, but if you have a USB cable, it’ll do the trick. The U614 delivers all of these features in an easy to set up format. Most users report that their U614 was complete when it arrived, and users also have good things to say about the unit’s comfort. Interestingly, the U614 is one of the few upright exercise bikes that’s noted for its powerful front-facing speakers for use on days when you forget your earbuds. Use the radio and blast out whatever’s on while you’re pedaling away frantically. 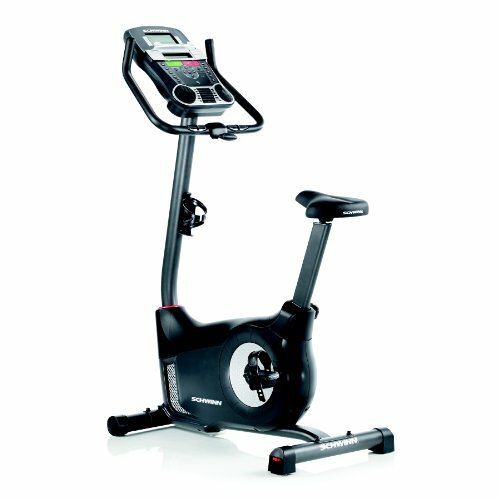 The Schwinn 170 Upright Bike (MY17) is the Cadillac option of the upright exercise bikes on our list, mostly for its digital suite. You’ll be able to set goals, use any one of 29 separate programs to reach them, rely on the unit’s magnetic resistance to guide you, all while you synch your RPMs with your phone via Bluetooth. More importantly than the above, the advanced technology in the Schwinn 170 works without a fuss. Users have also lauded the 170’s comfort for users of all dimensions, meaning that if you’re very tall and your workout partner is very small, you can both rely on the same machine, with a few adjustments. Making adjustments on the 170 isn’t as easy as it is with simpler systems, but it’s still very simple. At most, a hex key will be needed to make the adjustments necessary to transfer the seat height and other features for drastically different user sizes. The sensors on the 170 do a great job of capturing your biometric data, though some users claim that the posture the unit requires artificially inflates certain statistics. The Stamina 5325 Magnetic Upright Exercise Bike retails for around $200 and is notable for its adjustable seat, build quality, and no-frills approach. If you’re a tall user, this could be the wrong bike for you, though—it’s a sturdy unit, but there are sturdier units for the tallest people to use. The 5325 isn’t meant to be flashy, but it does lackluster in a few areas. There are only eight resistance levels on the 5325 despite its magnetic resistance mechanism, meaning that you may top out on this unit very quickly because the LCDs and software aren’t very complex. If you’re looking for an entry-level exercise bike, this might be the right bike for you, though. It’s easy to assemble the 5325, and it’s easy to get moving without a fuss. There may be some build quality issues with a few units, but on the whole, it’s a great bargain. 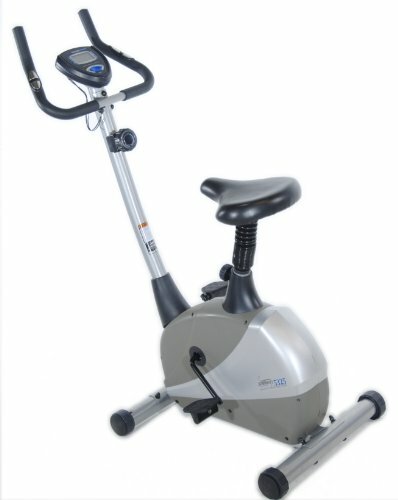 Why do people care about upright exercise bikes? How do upright exercise bikes stack up to other exercise methods that are primarily aerobic rather than anaerobic? In this section, we’ll give you a no-frills assessment of where upright bikes are great, and where upright bikes could be a bit better. Like all aerobic exercise, upright exercise bikes give you a chance to get your heart rate thumping and your volume of oxygenation in your blood higher. Relative to other forms of exercise machines, upright bikes are known for being low impact, which means that they’re unlikely to cause injury to your knees. Upright exercise bikes are also notable among exercise machines for their ability to provide a training curve very easily. All upright exercise bikes have adjustable resistance, which means that as your body adapts to a level of resistance, you can crank it up a notch and give yourself a new challenge. This is excellent for users who are severely out of shape, though take care that most bikes (and all of the upright exercise bikes which we’ll review today) have a user weight limit of around 300 pounds. Nonetheless, if you’re out of shape and would like to start getting back into good aerobic health, upright exercise bikes are some of the most forgiving machines out there for remodeling yourself. Sticking to a riding regimen is easy because you will know that the difficulty of your workout will always be calibrated exactly to how hard you want to push yourself. Interestingly, there’s also another advantage of upright exercise bikes that many value them immensely for silence. Upright exercise bikes can be extremely quiet forms of exercise, meaning that they’re perfect for households with people who are light sleepers but share schedules with people who like to work out very early or very late. Aside from being less likely to cause injury, upright exercise bikes are designed more like a normal bike, which means that your muscle growth and pedaling skills will transfer to real bikes much more easily than with other kinds of exercise bikes like recumbent exercise bikes. We’ll return to the difference between upright exercise bikes and recumbent exercise bikes in another section. Some users find upright exercise bikes difficult to install, and once installed, find them difficult to ride because of their dimensions. If you aren’t roughly average dimensions, upright exercise bikes tend to be a bit uncomfortable, even though their seats are adjustable in height and saddles are replaceable. The upright exercise bikes are less stable horizontally than other forms of exercise bikes because the user is high in the air and likely weighs more than the exercise bike. If you were to lean too far to one side, you might keel over while on an upright exercise bike, which could cause injury. Some people complain of back, shoulder, and neck issues while using upright exercise bikes. If you sound like you fit this bill, picking up upright stationary biking is probably not the right choice for you. Similarly, if you have debilitating knee issues, bike riding, in general, is not an advisable activity. Many of these issues find a fix by taking a class that focuses specifically on proper posture while upright cycling, but for users with herniated discs or other legitimate medical problems, the odd posture is the last thing you’ll need. There are a few other concerns with upright exercise bikes for those who have perfectly healthy shoulders and backs, though. Just like with non-stationary bicycles, upright exercise bikes can damage your sexual function, so if you decide to buy an upright exercise bike, you should make sure that it’s an element of your workout regimen rather than the only feature. It’s possible that there are saddles which can reduce the chances of damaging your sexual function, but you should look for a clinically validated trial before believing any manufacturer claims and making a purchase. Your health is too much to gamble on manufacturer claims. As alluded to earlier, there are a few different kinds of exercise bikes. In this article, we’re talking primarily about upright exercise bikes, but there are also other options for exercise bikes such as recumbent bikes and spin bikes. You should know the differences between each type of bike before buying. Recumbent bikes offer a few features that are different from the upright exercise bike that we’ve become familiar with. Recumbent bikes aren’t as common as upright exercise bikes or spin bikes, but recumbent bikes are increasingly finding use in therapy elsewhere as exercise. The biggest difference is that recumbent bikes for exercise are wide, close to the floor, and have a full-sized seat that the exerciser sits in order to pedal—think about the position of someone kayaking. Recumbent bikes are useful for many of the people that can’t use upright exercise bikes but who still want a primarily pedaling based workout. It’s also important to note that recumbent bikes are typically far less digitally endowed than upright exercise bikes, though they still have a basic stopwatch and timing features typically. Recumbent bikes are a great alternative to upright exercise bikes for people who can’t use upright bikes for whatever reasons, but we’ll discuss that in detail in another article. Spin bikes are the prototypical exercise bikes, and they have many of the same features. Spin bikes are the closest simulation of riding a normal bike that you can find, which means that they’re great for many different kinds of exercise. Many people wouldn’t make a distinction between spin bikes and upright exercise bikes, but in fact, they’re quite different. Spin bikes are a few chains away from riding on the street, whereas the upright exercise bikes which we’re discussing are not. 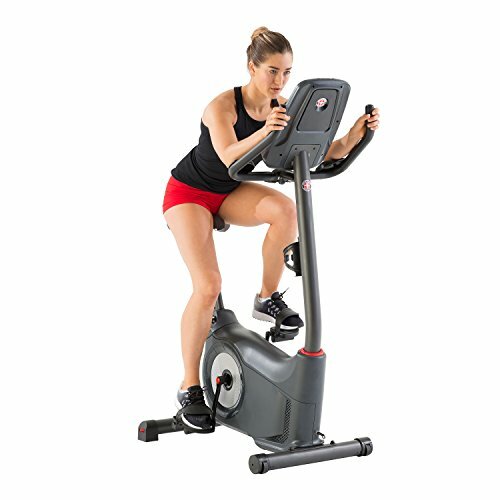 The internet parts of the spin bike are exposed to the world and require extensive gear shifting and manipulation by the user to get the most workout power from the machine, in contrast to upright exercise bikes, which tend to be enclosed in form factors that isolate their parts from the outside. Spin bikes use many of the same principles that upright exercise bikes use like the flywheel and resistance, and tend to be much easier for the user to tip over. Spin bikes are also much louder than upright exercise bikes, but that’s not as much of a concern. Spin bikes are typically used in the context of a spin biking class with other “spinners,” whereas the machines that we’re discussing are intended for home gym solo use. On the whole, spin bikes are less about technological progress tracking and more about being able to manipulate the machine itself to mimic the instruction of the class’s leader—typically to simulate hills or other functions that are handled digitally in upright exercise bikes. Spin bikes can mount in multiple different configurations, have their gears manipulated in various ways to simulate hills or flat stretches, and are the go-to tool for building aerobic capacity. Spin bikes tend to be extremely expensive and require some training to use properly, however. What Should I Pay Attention To When Choosing My upright Exercise Bike? Before any of the other things we’ll discuss in this section, you need to think about cost. Be sure to get a realistic idea of how much upright exercise bikes cost, and understand how cheaper bikes sacrifice their quality. The most expensive upright exercise bike machines tend to be heavy on technology and also heavy on the number of different resistance settings, biometrics gathered, and workout programs. The most expensive upright exercise bikes will come with integrated apps for goal tracking, and work with you to find the right workout to bring you to the level of fitness. With the most expensive and digitally endowed machines, you’ll practically have a physical trainer with you, almost. The less expensive bikes tend to have a lower build quality, but the largest point of skimping will be on the method of generating resistance as well as the number of different resistance levels offered. Simply put, it’s more expensive to provide more resistance options, and it’s also more expensive to provide magnetic resistance as opposed to one of the less sophisticated forms of resistance like the tried and true disc brake. Interestingly the more expensive machines have the potential to continue working indefinitely without breaking (although it’s unlikely) because they lack moving parts on the resistance generating portion of the machine. For the cheaper machines, you’re more likely to have to fix up something, as the bike’s innards are always subject to friction generated by pedaling. Many of the cheaper bikes have worse warranty plans than the more expensive bikes for this very reason, so it may be worthwhile to spend a bit more for an upgraded bike. Aside from cost, your fitness is an essential factor in picking out an upright exercise bike, which may be surprising. Some upright exercise bikes market toward aggressive multi-training athletes who need a machine that offers a wide range of different challenges, whereas others are designed to “just work” and be ready to go for the average user. If you aren’t at a high level of fitness, you probably don’t need the machines which offer dozens of different resistance levels and training regimens. You simply won’t be able to make use of the gradient of resistance until you’ve beefed up your legs and lungs a large amount. On a different level altogether, if you’re not strong enough to move the unit itself, it probably isn’t the right unit for you. You need to be able to move the machine itself around as necessary, even though you probably won’t be moving it around that much. Each upright exercise bike has a range of different resistance types and resistance levels. Resistance means a lot for an upright exercise bike, so we’ll break it down very clearly. First and foremost, resistance is implemented in the hardware of the bike via a system of a given kind. Of these, upright bikes with magnetic resistance as their way of generating resistance are the newest, most expensive, most desirable, and surprisingly, the most durable, too. The idea behind magnetically generated resistance is pretty cool: the flywheel that stores the rotational energy generated by your pedaling is made of a ferromagnetic material (or has a ferromagnetic material embedded inside of the plastic shell) which constantly passes through two prongs, which are electromagnets. The two electromagnets can increase the level of capacitance flowing between the two of them, through the flywheel, thus causing a force that is in opposition to the rotation of the flywheel, generating resistance. Alternatively, the electromagnets can decrease in power to give the rider a break. Magnetically generated resistance doesn’t incur any friction on the machine’s parts, which means that they can last a very long time—maybe even decades—before requiring repair of any kind, even under heavy use. The way the machine generates resistance isn’t the end of the resistance story, however. Resistance types can also refer to the simulated source of the resistance as defined in the machine’s software or hardware. Some machines may be able to simulate resistance from a steep hill and also simulate resistance from carrying a heavy load. If you’re tired of just pedaling, try simulating pedaling up a hill to see how the level of resistance and your effort increase. Other machines may offer a simulation of resistance from one source (like hills) but not another (like mud). This means that your training won’t be as focused, nor will you be able to reach the same level of training challenge using these machines. The level of resistance is closely related to the types of resistance that a machine can offer. A machine with a wide level of resistance settings is a machine that you can grow your capacity with, calibrating your workout exactly to your desired level of discomfort. Everything comes at a price, though. Machines that offer different types of resistance or a wider range of resistance levels are always more expensive. Resistance is perhaps the single largest feature to pay attention to while you are picking a machine, so examine the manufacturer’s literature carefully—and also take a gander at the owner reviews. The comfort level of the upright bike is also an important concern, but it’s important to be clear on one thing: upright exercise bikes with saddles that are uncomfortable. You can sometimes buy replacement saddles that are more comfortable, but typically not. The saddle will be your biggest source of discomfort that stems from the machine itself aside from your workout. If a certain machine is uncomfortable for reasons other than the saddle—perhaps because of the handlebars or pedal straps—you’ll become unhappy very quickly. A quick test of the unit at your typical use intensity tells you everything you need to know about how comfortable your body finds a machine. The upright exercise bikes that we’ll review are digitized units. While it’s possible to sit on these upright exercise bikes and pedal, you’ll do much better fitness-wise if you engage with the digital display and figure out how to optimize the machine’s performance for what you want. Not every upright exercise bike is as easy to use as every other—some are notoriously confusing, while others are simple and elegant to use. Especially if you’re buying the upright bike as a gift for someone else who is a bit technically challenged, the ease of use of the unit is critical to your purchasing decision. Ease of use includes ease of setup. Setup may include assembly, initializing the software, or simply taking the upright bike out of the box. You’ll probably only set up the unit one time, but having a hassle where you don’t need one can be immensely frustrating, so be sure to take ease of setup into account. Other bells and whistles that can appear on upright exercise bikes like water bottle holders, cooled seats, or blood oximeters might be a factor in your purchasing decision. The rule of thumb here is to understand that these additional features are probably not the focus of where the engineering time of the bike is unless the bike’s advertisement emphasizes these odd features. In general, you shouldn’t be making your purchasing decision based off of these additional features, as they’re rarely as robust as required to be useful. Some upright exercise bikes can fold in half, and some cannot. The obvious thing here is that the foldable bikes are easier to move around your home gym and take up less space. What is less obvious is that foldable bikes can be just as well-made as their non-folding counterparts. We’ll go into depth on the issue of folding bikes versus non-folding bikes in another article, but for now, just think about it as a question of whether you intend to let your upright bike sit in one spot or whether having the ability to move it around easily will be a major boon. 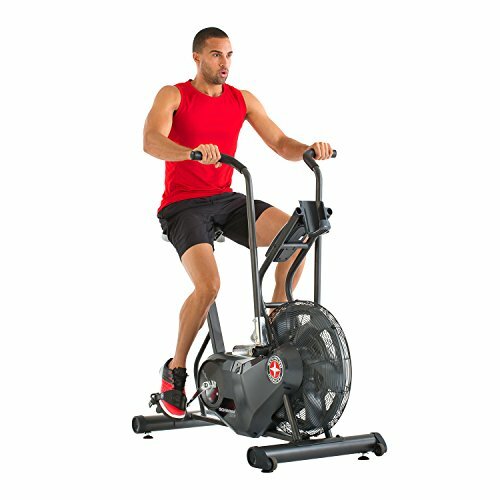 Our top pick for the best upright exercise bike is the Schwinn 170 Upright Bike because it combines a sophisticated digital feature set with smooth and quiet magnetic resistance which you can vary in all sorts of different ways, all while tracking your progress across a wide variety of metrics. For those looking for a budget bike, it’s hands down the ME-708. For what it lacks in complexity, the ME-708 makes up for it with sheer simplicity and durable efficacy. The other bikes we’ve reviewed on this list aren’t bad by any means. However, they’re just not on the short list of the very best that’s out there. If you’re interested in purchasing a bike, be sure to do a bit more research, and check out some of the resources in the section below to get more information. Good luck with your upright biking adventure!